strength in themselves, as well as their studies. It is expressed through the development of right relationships and the provision of positive learning experiences which acknowledge the gifts and respond to the needs of each person. It is concerned with creating a harmonious school with clear, consistent and just disciplinary and behaviour management practices. Emmaus employs a horizontal Tutorial structure across our Middle and Senior Schools whereby each group consists of peers from the same Year level. This is the foundation of a student’s support network at the College and nurtures them to establish meaningful relationships, build emotional resilience and encourage spiritual awareness. The Tutorial group is instrumental in developing the whole person. It engrains a deep respect for others and a maturity whereby students are responsible for their choices, actions and attitudes. 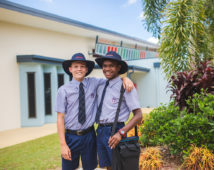 In Year 7 students are supported in settling into life at Emmaus and using a range of new academic and social skills. Friendships, safety and respect are important foundations to commencing a healthy and fulfilling journey at the College. In Term One students focus on finding their way in a new environment and the various tools available to them such as timetables and ICT skills. Students also commence the Beyond Blue SensAbility program which continues for the duration of the year. Our retreat during this term explores relationships, teamwork, restorative practices for conflict and anti-bullying. These concepts are also reinforced on a weekly basis in the Tutorial group, an environment which is most important in establishing a sense of belonging for students. In Term Two students are encouraged to participate in as many facets of the College’s life as they can. Students are encouraged to give their best in a Novenathon – a multi-week athletics activity schedule where students can participate in a range of sports and challenges as part of their tute group to help build teamwork, unity and confidence. 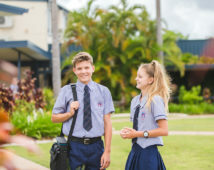 Other programs include the Daniel Morcombe Child Safety curriculum, exploring goal setting through writing PLPs (Personal Learning Plan), and attending the anti cyberbullying presentation Brainstorm with students in Years 8 and 9. In Term Three students learn to develop their sense of self worth and purpose. A big focus this term is on maintaining healthy bodies and healthy minds. The Term Three retreat is provided by Project Hatch and underpins these concepts as well exploring the many challenges of adolescence and coming of age, particularly in regards to decision-making and choices. Towards the end of this term and into Term Four the focus shifts to taking charge of our lives as we prepare to embark on Year 8. The SensAbility program helps greatly with this to define a sense of future, a sense of control and of course, a sense of humour. 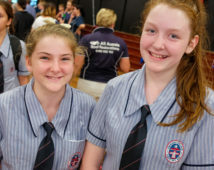 The Year 8 program is geared towards making new friends with a continued focus on planning and time management techniques specific to the needs of high school students. Our first retreat is Friendship Day, which is usually held at the beach. In Term One and Two we look at developing our teamwork and communication skills. These are two important and commonly used skills in everyday life that are extended and developed further on the outdoor education camp for all Year 8 students held towards the middle of this term. This is held at Fairbairn Dam, 25km south of Emerald. The aims of the camp are to build self-confidence and self-esteem in students; provide students with problem solving challenges; develop social skills and build a sense of community and develop leadership qualities. Students challenge themselves and dare the high ropes; build rafts and attempt to keep them afloat; engage in trust activities and group problem solving and canoe via GPS navigation. Term Three sees us looking at keeping safe, particularly in physical and online environments. 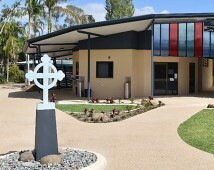 All Year 8 students are taught the Daniel Morcombe Child Safety Curriculum as part of this. Our two-day retreat involves participating in a one day interactive presentation by Real Talk Australia which examines our variety of relationships and also discovering and developing our personal identity. Day two involves students extending on this presentation through a number of reflective, small-group activities. In Term Four we explore leadership and how we can make a positive contribution to our community. Students prepare to move into Year 9 and take on roles as leaders of the Middle School campus. We conclude the program and the year with a fun day of social activities such as ten pin bowling and a trip to the movies. Tute Sporting Competitions – Students battle it out for the coveted Tute trophy in Netball, Touch Football and the deadly Dodge Ball! These activities are conducted during lunchtime and attract a large number of spectators and supporters. Year 10 buddies are assigned to each Tute and help organise, coach and encourage their Year 9 teams. Relationships Day – students are involved in a variety of learning experiences around the issue of healthy relationships and keeping themselves safe. This includes informative sessions on issues such as cyber safety as well as hands on lessons in areas of self-defence and relaxation techniques. Peer Pressure – The retreat theme in Term Three focuses on peer pressure, self-esteem and friendships. “Am I willing to do what’s right even if it means going against my friends? Am I a follower or a leader? How do I handle alcohol, drugs, bullying?” These and other tough issues are addressed in this Retreat Day. The Year level is split into two groups and also enjoy a day of activities at Kemp Beach. Year 10 is an exciting year where students explore a variety of academic and community activities within a holistic learning framework. There is a strong emphasis on developing self-awareness and consolidating learning ready for embarking on Years 11 and 12. Students are encouraged to explore their potential, try new things including work experience and take greater responsibility for their own learning. A Senior Education & Training (SET) plan is developed to encourage students to think about their future, consider their abilities and investigate their options for careers and further education. Through this process Year 10 students will make informed decisions about completing the senior phase of learning and about their future. It helps them to make immediate career and learning choices and to lay the foundations for lifelong learning and lifelong career development. Students are provided with a range of elective choices to inspire, motivate and experience learning to the full. Another focus of the pastoral program is developing responsible and safe citizens, where students explore digital safety, personal well-being and positive relationships. The aim of pastoral care in Year 11 is to develop students into young adults, as they begin their journey into senior schooling. Students are encouraged to develop skills for life after school including time management and interpersonal communication along with exploring leadership styles and opportunities. In addition,they are supported in making responsible decisions in regards to life balance with their academic, social, sporting and family commitments. Specific programs offered during Year 11 include participation in the Year 7 Buddy Program and working as Year 8 Camp leaders to develop leadership skills as well as PDE (Personal Development and Education) sessions focussing on youth mental well-being. The aim of pastoral care in Year 12 is to continue developing students into young adults, as they commence their final year of schooling. Students are encouraged to develop skills for life after school, including time management, interpersonal communication along with exploring leadership styles and opportunities. In addition, they are supported in making responsible decisions in regards to life balance with their academic, social, sporting and family commitments. Programs offered during Year 12 include a range of leadership opportunities and PDE sessions focussing on spiritual, physical, mental and social well-being.